These 10 Blue Sapphire Engagement Rings Will Warm Your Heart! Is blue your favorite color? If so and you’re on the hunt for an engagement ring then a blue sapphire ring should be top of your list! We’ve selected 10 of our favorite blue sapphire rings to offer you a selection of styles to suit your taste. Whether you’re looking for something classic to complement your style, or for a bold gemstone that screams for attention, our top 10 rings show off the options available to you! A sapphire is a gemstone which is famous for being the birthstone for September and the gem used to celebrate a 45th wedding anniversary. However that isn’t the only occasion for which a sapphire can be worn and we think that sapphires make a great choice for an engagement ring. Traditionally a sapphire is blue in color however sapphire gemstones can come in a range of colors from purple to green. Interestingly, the only color that a sapphire can’t be is red as this would be classed as a ruby (which of course is just as beautiful!). Sapphires are known to have been worn as jewelry as far back as the Roman times and when used in jewelry are polished until they display a fantastic shine, perfect to be used as the centerpiece for rings, necklaces, earrings and much more! The color of a sapphire comes from the minerals within the gemstone and sapphires get their color from a particular mineral called corundum. There are other minerals contained within a sapphire (such as iron and copper) and the color of the stone will vary based on the amount of each mineral that the sapphire contains. One thing is for sure, sapphires are tough! They’re actually the third hardest mineral in the world and are noted as being 9 on the Mohs scale which is used to measure the hardness of minerals (diamonds are the hardest mineral). This is great news if you’re wearing a sapphire as part of a ring because it means that it is very durable and won’t scratch easily. Its very likely that you may already own a sapphire, or at least something which contains sapphire. Sapphires are so hard that they are often synthetically produced to make robust sapphire glass (often used by watch makers and even by Apple for some models of their Apple Watch). What’s the difference between a natural sapphire and a simulated sapphire? Some of our top 10 sapphire rings contain what’s known as a ‘simulated’ sapphire. A simulated sapphire can be distinguished from a natural sapphire as it is one that is made within a lab whereas natural sapphires will be mined from beneath the earth. When we say ‘made’, these simulated sapphires are in fact ‘grown’ under controlled conditions. You might be a little put off from buying a simulated sapphire by thinking its not a real or ‘natural’ stone. 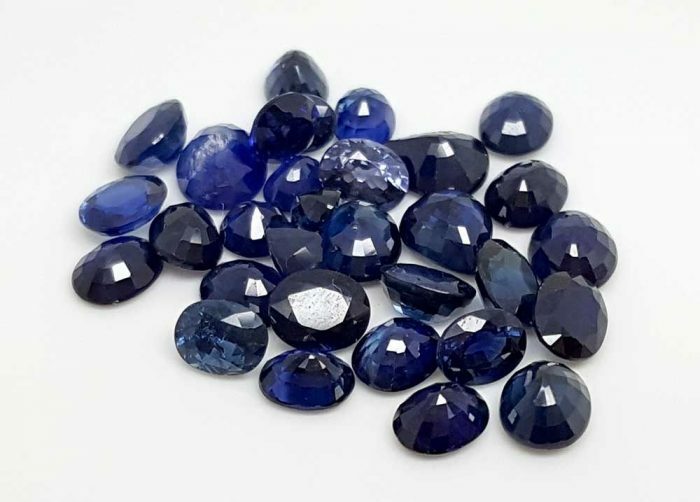 However many simulated sapphires are indistinguishable from natural sapphires when it comes to their visual appearance, physical shape and also their hardness. Natural stones are noted for their rarity however simulated stones are also known to be of very high quality and in appearance are generally of equal beauty. Gemmologists will be able to tell the difference, but to most people a simulated sapphire is just as attractive and just as desirable! Where have I seen blue sapphire rings before? The real question is where haven’t you seen a blue sapphire ring! Blue sapphire rings are famous for being gifted as the ultimate romantic gesture and are the ultimate example of an engagement ring. One of the most famous examples of such a gesture was given by the French Emperor, Napoleon Boneparte, who chose a sapphire and diamond engagement ring for his fiancee Josephine in 1796. The ring has since sold for almost one million dollars but rest assured, our top 10 list contains a section of rings for a more modest budget! Blue sapphires have since been the engagement ring of choice for a long list of celebrities including Penelope Cruz and Elizabeth Hurley and its also one of several engagement rings chosen and worn by Victoria Beckham. 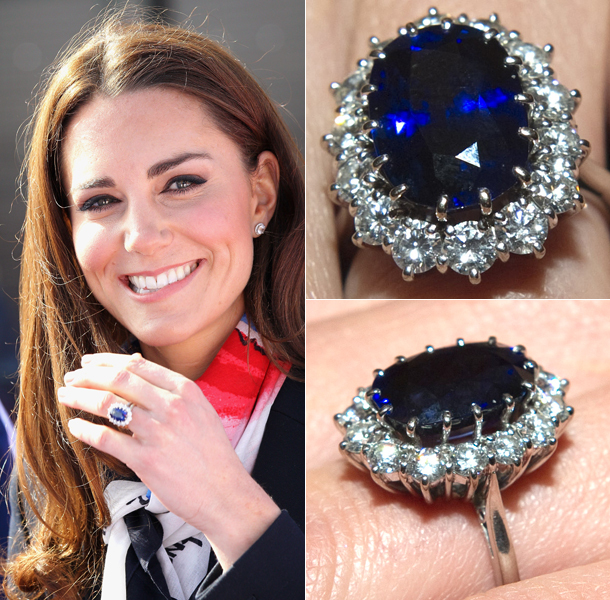 But by far the most famous and perhaps the most beautiful blue sapphire ring is owned by the Duchess of Cambridge, Kate Middleton. This ring famously belonged to the late Princess Diana and was the ring of choice for Prince William when he proposed to Kate. This 18k white gold ring is truly stunning and includes a 12-carat oval blue sapphire which is elegantly set amongst fourteen diamonds. If you’re looking for an example of why blue sapphire rings are so sort after, this ring certainly shows why sapphires are so popular. What are the benefits of wearing a blue sapphire? As with many gemstones, there are said to be a range of benefits to be gained from wearing or being close to a sapphire. This gemstone is commonly referred to as the wisdom stone and is said to help with making wise decisions and for promoting intelligence. 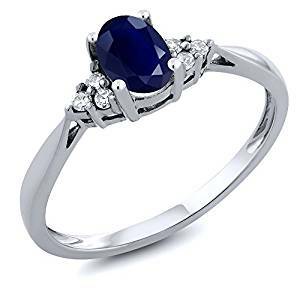 Sapphires are also said to attract good luck and in particular the blue sapphire is known as being connected very closely with love and is often used to symbolize affection for a loved one. 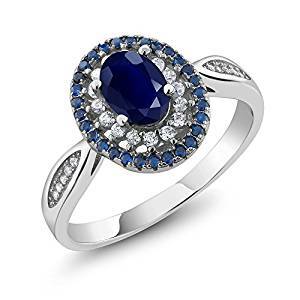 So by wearing a sapphire ring, not only will you look great but you may even be luckier and wiser! It’s not a new thing that sapphires have been admired and sought after. The ancient Persians believed that the deep blue color of the sky came from a sapphire as a result of the earth resting on a huge sapphire gemstone. Regardless of what actually causes the sky to be blue, there’s no denying that blue sapphires are absolutely gorgeous. So now that you’ve found out a bit more about sapphires and what makes them so great, you’re ready to find out more about our top 10 blue sapphire engagement rings! 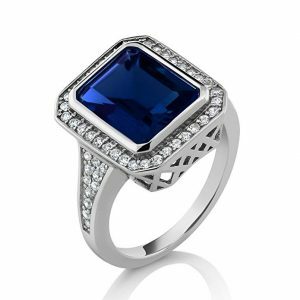 We had to start with this ring which effortlessly shows off the deep blue sapphire gem. 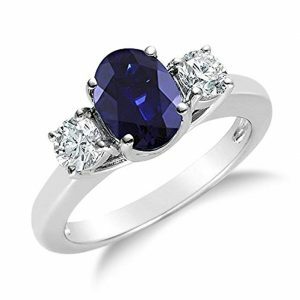 This classic ring has a 14k white gold band which elegantly holds the sapphire in a 4 prong setting. To complement the stunning sapphire stone, the ring also includes 6 white diamonds which sit around the larger blue sapphire. The diamonds really are the perfect pairing that make this a truly attractive ring. We think this ring is so attractive and the oval sapphire is perfect if you’re looking for a dainty and timeless engagement ring. It also looks great with any outfit, whether you’re dressing up for a special occasion or relaxing in your chill out clothes. The budget for this ring is mid-high however you really are getting a lot of ring for your money! In addition to the 14k white gold band, the sapphire in this ring is a natural gem, as are the diamonds. This all comes together to create a beautiful ring which perfectly balances the deepest shade of blue with the crystal clear whiteness of the diamonds. What’s even better is that your ring will come in a cute little box so its ready to give as a gift and has somewhere safe to be kept. This ring would certainly be first on our list of recommendations if you’re looking for a sapphire engagement ring. The designers of this ring, Gem Stone King, have been making jewellery since 1903, so they know a thing or two about rings! They offer a range of jewellery to suit any occasion and even offer the opportunity for you to personalize your gift. We’d definitely recommend taking a look at their website to see some of the other stunning designs on offer. This one really is a statement piece of jewelry! 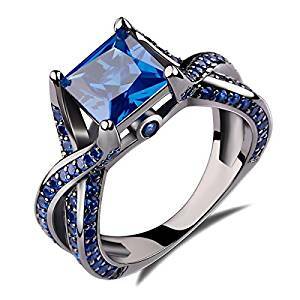 With a huge princess cut blue sapphire held in a 4 prong setting, this ring will certainly draw attention and is a celebration of blue which really catches the eye. The blue sapphire is the star and looks very large! What’s quite different about this ring is that the band is black plated sterling silver so rather than the more traditional white or yellow gold, this ring has a very distinctive look. Another feature of this ring that you can’t help but notice is the use of small blue cubic zirconia gems that decorate the band. 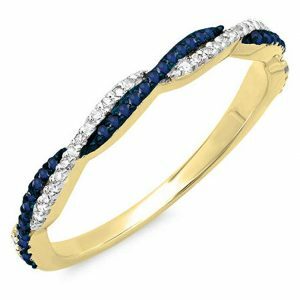 These deep blue zirconia gems are the ultimate setting for the blue sapphire and in addition to the twisted shoulders of the ring the band offers a real wow factor which means this ring looks great from any angle! Another thing we love is how good it looks for the price. The ring is ideal for you if you have a smaller budget and you won’t have to worry about quality. It looks great and even comes in a small ring box – we love the small details! 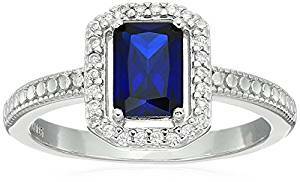 The blue sapphire is a simulated gem and the designer lists it as a very good cut which means the piece will reflect a lot of light and will look great on your finger (its close to being an ideal cut but without the price tag!). 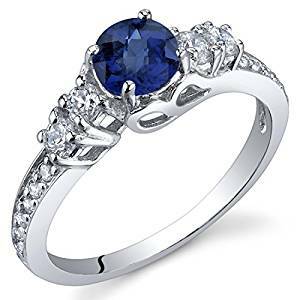 Overall this option is a great option if you’re looking for a sapphire ring which stands out and shows off this wonderfully blue gem. Our next choice really is an elegant ring. This natural oval blue sapphire sits perfectly amongst a number of cubic zirconia. Some may that this piece is too busy, but we think the white and blue gems really complement each other well and we particularly love the oval shape of the ring which mirrors the shape of the blue sapphire. The setting sits quite high and almost appears to float above the band of the ring which is another feature that makes this ring very attractive. The designer has included 6 smaller gems on each side of the band which looks extremely elegant and finishes the ring perfectly. The ring almost looks like an antique and is very pretty. If you’re looking for something simple then this piece may be a little over the top, however we feel that it has a subtle elegance and sparkles beautifully. This is another option from Gem Stone King and they’ve done a great job again. You’ll get a lovely jewellery box to keep your ring in but to be honest, we don’t think it will be spending very long in the box! This ring offers the perfect balance between sophisticated elegance and finer detail that celebrates this stunning blue sapphire gem. For a ring which has a lower price tag, we’re amazed at how stunning it is! This is a lab created sapphire which has a checker board top that offers fantastic sparkle. In addition to the large blue sapphire, the ring has 16 white cubic zirconia (it really does sparkle!). A detail which is particularly attractive is the side stone setting, which includes some lovely detail on the band. It’s almost as though the band flows and twirls around the setting. This, in addition to the elegant, thin band results in an effortless ring which will accentuate your fingers. 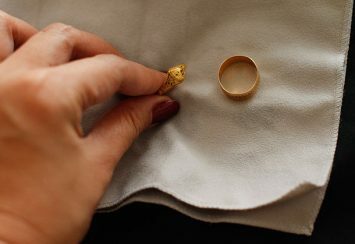 This ring is made by Peora and the craftsmanship is very impressive. This designer make a range of jewelry including rings and earrings. We were really impressed to see that Peora include a certificate of authenticity which proves that this piece is made from pure silver and that the simulated gems are of high quality. A great product made by a designer who takes a real interest in customer care – that’s what we like to see! We couldn’t help but choose this piece which has a black gold rhodium plated band. The black band really does provide an attractive backdrop for the simulated blue sapphire and offers something a little different compared to more traditional silver or gold bands. The star of the show on this ring however is the blue sapphire, which sits effortlessly between two colorless cubic zirconias. This piece really is a steal and another example of one that looks far more expensive then it actually is. And you don’t need to worry about missing out on the extras as your ring arrives in a lovely gift box and for a small additional cost you can even have your ring engraved! This ring is made by Blue Apple Co and they have created a really attractive piece of jewelry. We love some of the finer detail in this ring such as the smaller gems which are set on the band. The bright white color of the gems on the band add that extra sparkle and make this one not to miss. Sapphires come in all shapes and sizes and we’ve chosen one that’s a little different to the others in our list! This option features a mixture of blue sapphires and white diamonds to once again showcase that classic combination of blue and white gems. Whilst other options in our shortlist feature a large sapphire as the centrepiece, this ring offers 70 (yes 70!) stones in total along the band. The sapphires and diamonds are round and natural so you’re definitely getting your money’s worth with this piece. The band has cleverly been designed to swirl the blue and white diamonds between each other, resulting in a stunning ring that will look elegant and beautifully dainty on your finger. It does have a higher price tag however you’ve got the choice of either white, yellow or rose 14k gold (and don’t forget you are getting 70 gem stones!). This item is made by Dazzling Rock Collection and this ring certainly lives up to the company’s name – it really does dazzle! The maker of this ring states that they made it with care and attention to detail. They also say that they don’t just make jewelry but they craft it and with this ring its clear to see that they are true to their word! What’s better than 1 beautiful gem? 3 beautiful gems! If you’ve got a bigger budget to spend then this ring is one that you have to take a look at. At the center is a stunning genuine oval blue sapphire which glimmers effortlessly. As if that’s not enough, set on either side of the sapphire are two beautiful diamonds to complete this elegant 14k white gold ring. Some rings never go out of fashion and this is definitely one of them. We think this ring will look great with any outfit. It is available from Voss+Agin and after a quick search of their wider offering you’ll soon see that they’re all about quality, offering a wide selection of attracting rings and necklaces. The band is simple yet elegant and really finishes the ring well. Your eyes will be instantly drawn to the sapphires and diamonds which are the centrepiece and the simple design is sure to be timeless. The simple four prong setting finishes the ring perfectly, making this an extremely attractive piece of jewelry. If you’ve got a slightly higher budget and you’re looking for a classic and elegant sapphire option, this is well worth a look! This option is another classic that screams elegance. This ring features an emerald cut sapphire which although is lab created, catches the light wonderfully. Perhaps the main selling point of this ring is the shape of the sapphire which looks almost rectangular. 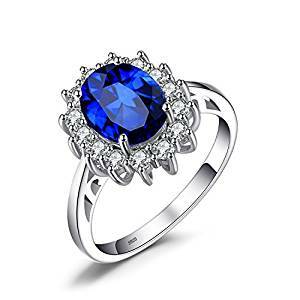 This, along with the cubic zirconias that surround the sapphire, give the ring a really classic look. We think this ring looks like a timeless family heirloom which has been passed down through the generations. It really is a pretty piece of jewelry. The band is sterling silver which has been rhodium plated. 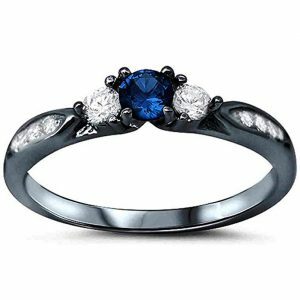 This further complements the deep blue sapphire gem, and gives the ring that extra shine and also additional durability. It should therefore be a perfect option if you’re looking for something to wear on a daily basis. The additional detail on the band adds another dimension to this ring and the repeated circular design works well with the more angular lines of the centrepiece of the ring. One of the great things about sapphire stones is that they quickly add color to any outfit and this piece is no different. The deep blue sapphire will make the perfect accompaniment to any outfit and is sure to brighten up your day! It is from the Amazon Curated Collection which means that it has been hand selected and inspected by Amazon’s gemmologist to ensure that it meets their high standards. It also means that the ring will come in a custom gift box, making this a great option for a gift for a loved one, or a special gift for yourself. Go on, you deserve it! Looking for a chunkier statement ring? If so this vintage emerald cut sapphire ring will suit you well! This sapphire is actually an octagon cut gem and is quite different to a lot of the rings we’ve reviewed in that it feels a lot larger. This is a simulated sapphire but really looks like a natural gemstone. The smaller gems that surround the sapphire add an additional dimension to this piece and set the central gem perfectly. In addition to this the ornately designed sides of the ring further add to the vintage feel and make the piece feel like a really bold and beautiful piece of jewellery. Some might say that this ring is a little masculine, but we think that this ring is a gorgeous design that will go with a wide range of wardrobe choices. Another attractive feature is the design of the band, which sees the continuation of the smaller gems that surround the large sapphire. The band also increases in width as it nears the centerpiece, something which helps to set the gemstone. We also love that it not only feels comfortable to wear, but due to the shape and design is extremely tough which means that its a great option for everyday use. The makers of this ring, Gem Stone King, say that every ring they make undergoes rigorous inspection to ensure they are of high quality and we believe them! 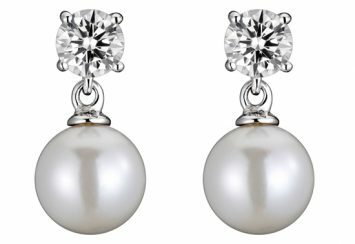 You get a lot for your money with this piece of jewelry and this is a great choice if you’ve got a low-medium budget in mind. You’ll also receive your stunning piece in a handy little box so its ready to go if you’re looking to give this is a gift or its also very useful to store the box in if this is a gift for yourself. We couldn’t complete our list of sapphire rings without perhaps one of the most famous sapphire pieces ever worn. You’ve probably seen photos of Princess Diana’s ring which was later given as an engagement ring to Kate Middleton by Prince William. Of course this isn’t the exact piece, its essentially a replica, but it is nonetheless a beautiful ring and at a bargain price! Produced by JewelryPalace, at the center of this classic ring sits a beautiful blue sapphire which is held in place by a multi prong setting. It reminds us of an attractive flower with a bright blue head. The smaller white gems that surround the sapphire frame beautifully and create a dainty, elegant ring which will extend your finger. We’re sure that you’ll turn heads with this stunning gem and it’s naturally an eye-catching piece. The band is made from sterling silver and we love some of the finer detail on the top if the band. 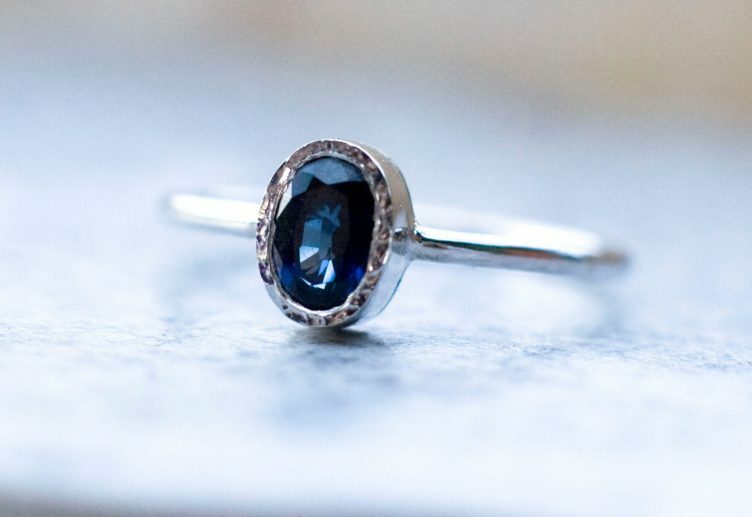 Whether you’re a fan of the royals or you’re simply looking for an elegant sapphire ring that can be worn for all occasions, we’re sure you won’t be disappointed with this beautiful option. If you’re not totally in love with sapphires by now (we hope you are after our shortlist! ), JewelryPalace offer a range of alternative colors for this ring including a red ruby, amethyst and natural blue topaz. But our favorite has to be the blue sapphire which gives this ring a classic look and makes it the perfect romantic gesture.